GAME ON! For nearly two decades, Sarah Ruiz’s ex-husband has controlled her. But no more! With Alex finally behind bars, Sarah is ready to put her dreams first. However, her safety and security are short-lived and she finds herself twisted in a web of lies even more complex than she could have guessed. To find the truth and protect her children, Sarah must step into a world where the game played is one of life and death. It’s no longer about control, it’s about survival. From the author of The Controlled, Game On! continues the story of Sarah Ruiz, a fitness model and mother of five whose battles with her manipulative ex-husband will leave you turning the pages to find out who wins the game. 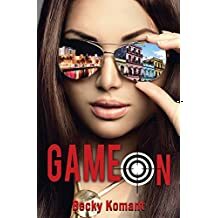 GAME ON is the long awaited sequel to THE CONTROLLED. It continues on where THE CONTROLLED left off. Sarah was sitting wondering if Christian would soon show up or if she would finish off her vacation alone. She truly did miss Christian and knew her ex-husband had caused the breakup. With Alex in prison, things should turn around and she will be able to resume her life; free from Alex and his controlling ways. However, to Sarah’s surprise when she return, who was awaiting for her at the airport? Shocked and afraid all Sarah could do was follow Alex’s instructions. She had no clue what was going on or how he managed to get out of prison. Sarah new she had the separation papers and the restraining order and would use that to her advantage. The only problem…somehow they went missing. How was Sarah ever going to gain control of her own life? Once again, Ms. Komant has blown me out of the water. I actually had to put this book down or would have stayed up all night to finish it off. There are definitely twists in there that I did not see coming. The best part was that it was not predictable like most novels. I actually thought at one point there might be some plastic surgery/disguise! The character development was very well put together and the storyline flowed very smoothly for being 32 chapters long. There are not too many authors out there that have such a profound effect on me. I was lost in the book. It felt like I was there living with Sarah and going through everything with her. It is best to read both books, however you could read each on their own, but it might be a bit confusing. It is my hope that this is not the last book from Becky as she is a fantastic writer one that I would follow. Definitely a must read.